Birthday party week continues! And today is all about celebrating with Minnie and Mickey. First up — favor bags! We made Minnie and Mickey Mouse bags for each of the kids that came to my daughter’s party. 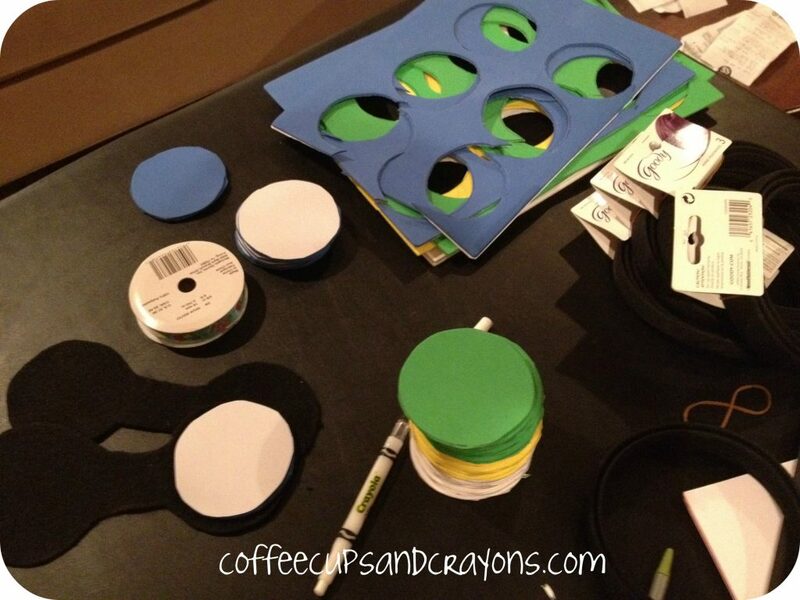 Inexpensive and easy and cute! My oldest helped me paint mouse faces on each of the red bags. We used red bags because that was all we could find enough of, but it would be cute to use buckets and chalkboard paint if you found a good deal on them. Then I made bows for the girls’ bags by looping ribbon into a bow shape (#2) and tying it in the middle with a skinny ribbon (#3). 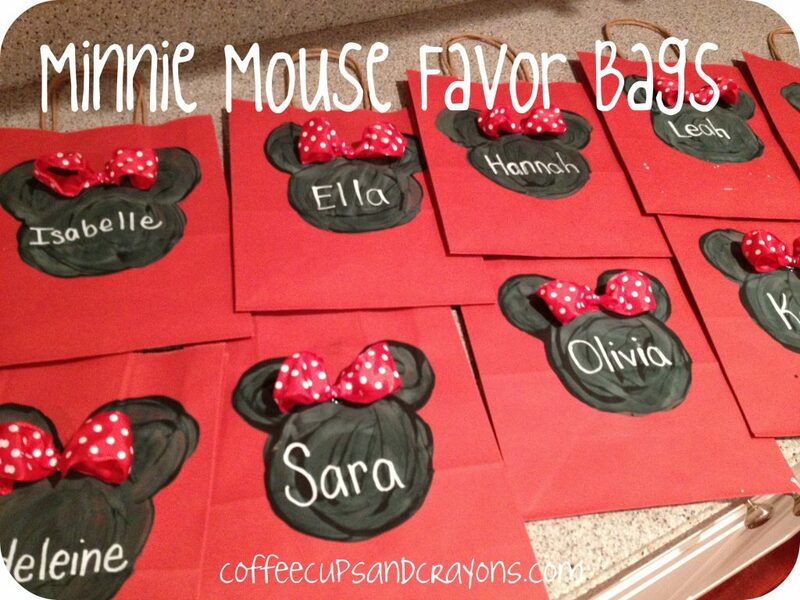 I glued the ribbons on the Minnie bags and then wrote the kids’ names on the faces with a white paint pen. Here’s the ones for the girls — cute right? None of the boy ones made it into this photo, but they were the same minus the bow. 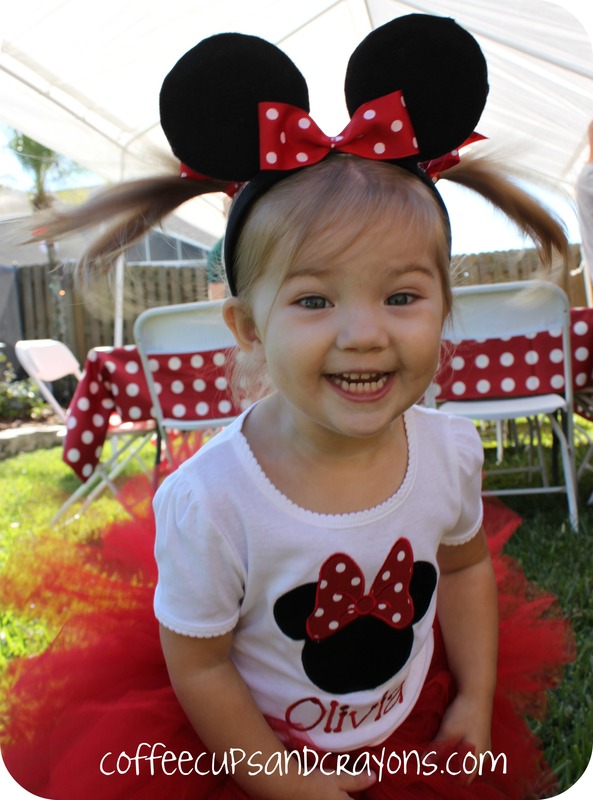 They other favor I made was a little more involved, but a definite hit at any Minnie or Mickey themed party — mouse ears! 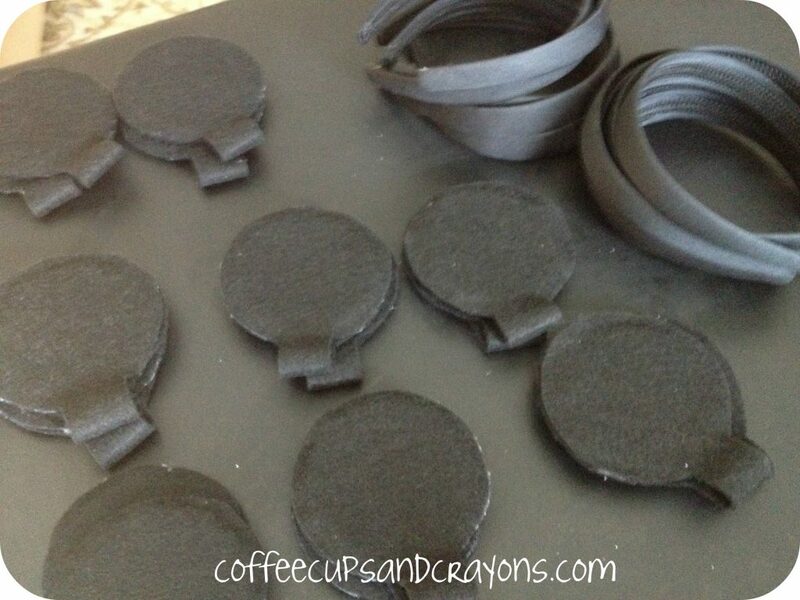 The Suburban Mom has a great tutorial for how to make your own Mickey or Minnie ears! You have to check out her instructions if you are thinking about making them. I basically followed her directions, but took a few short cuts. I liked the way the covered headbands looked, but am just not that ambitious. Instead I bought fabric covered black headbands at Target for about $1 each and fit the mouse ears around them. And they were a hit! Look how cute the birthday girl looked in her Minnie ears! OMG – she is adorable!!!! Love love love this – We wanted to do the same theme for our daughters 2nd birthday and you have inspired me to get VERY crafty! Out of curiousity, where did you find her outfit? Or did you make it? Hi Janna! Thanks so much for visiting! First, let me say I love that you think I could have made that outfit! Ha ha! I answered it on FB but I totally should have put it on the blog too. I got her outfit from Carousel of Creations on etsy. I had her change the pink to red. Have fun crafting the party!!! I’d love to see photos when you’re done! where did you get the polka dot table cover? i love it!!! From IKEA. In the cut your own fabric section. I got it on sale for $3/yard on sale. We have used it more than once since and it’s held up perfectly! Thanks for stopping by! 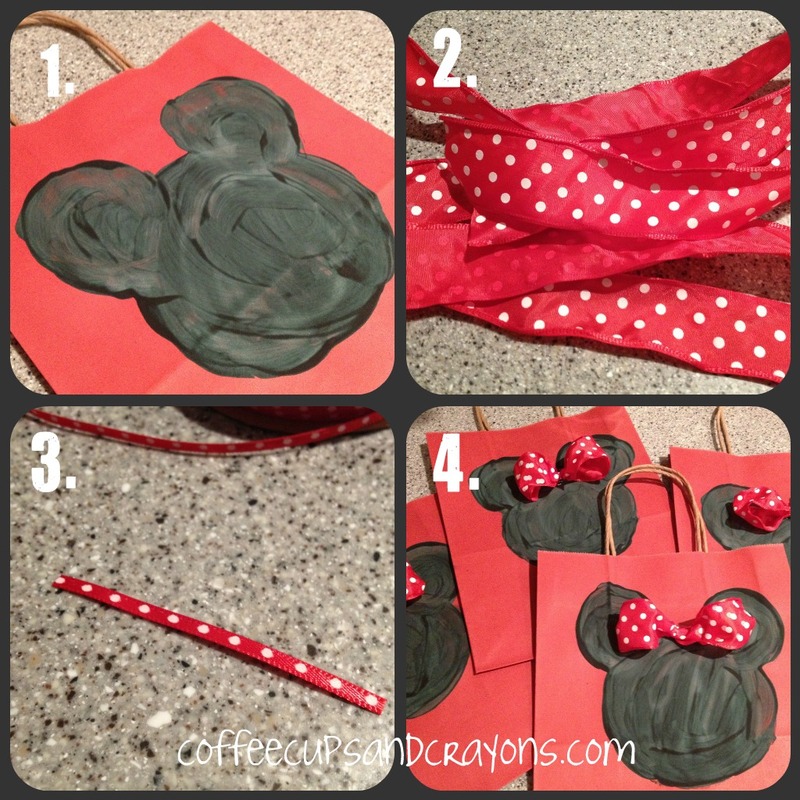 I love the favor bags.. what kind of paint did you use ?? would love to make these for my maddies Party. I’m so glad you like them! I just used poster paint that we had on hand. I’d love to see a pic of yours when you’re done!